For me, this is much bigger than a case study. This is the story of a very special Connemara pony. A pony that changed my life. He has brought friends into my life, and he has taken me a to a new level of understanding. I can honestly say that I am not the only person affected by this pony. He has a talent for changing the lives of many. The biggest lesson he taught me is that founder is not a foot issue; it is a whole body problem! Now let me finish introducing Druid. He is a pony that should not be alive except he had many lessons to teach. Everything about him is special. 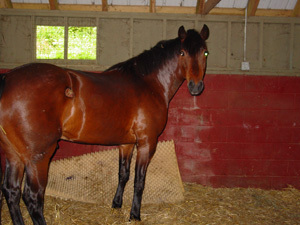 Druid was the family pony. He did anything asked... fox hunting, natural horsemanship clinics, shows, and just hacking out. He is great with children. Look at this collection of pictures. They only begin to show how much heart this guy has. When I met Druid, he did not look like the guy in any of these photos. He looked like the pictures below. Druid was acutely laminitic. He could not move and was down 23 plus hours a day. His X-rays indicated that he had rotated significantly and was perilously close to having the coffin bones penetrate the soles. The arrows are marking the hoof wall, front of the coffin bone and the lower edge of the coffin bone. Notice how thin the sole is. At this point, the vet had never recommended a trim or any foot care. He had put Druid on heavy doses of medication and told the owners to stall him. The only comment that he made about the feet was that, eventually, Druid would need corrective shoes. In defense of the vet, I have learned that laminitis is not just about the feet. I think the vet was trying to correct the most obvious risk factor, the diet. 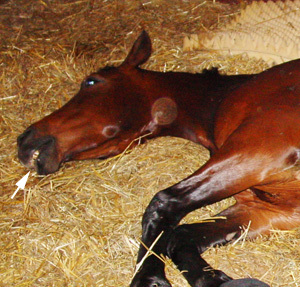 To truly help the laminitic horse, you must identify the cause and address that. Trimming does not cure laminitis!!!!! This is true of all laminitis no matter how mild. 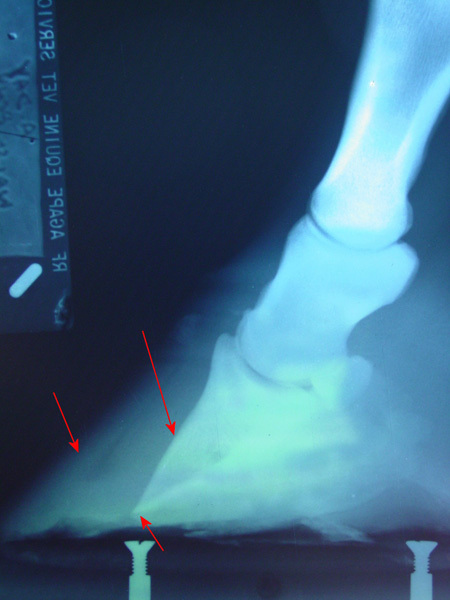 If your horse is showing signs of foot discomfort, start looking for the cause. Mechanical hoof issues will respond beautifully to trimming. All other issues will linger until you figure them out. Look at the diet. Look at the muscles. Look at the skeleton. Look at the hormones. Not long after this X-ray was taken, Druid's coffin bones sank, and the coffin bones penetrated in all four feet. The day that this happened was beyond description. We had struggled to get him up and out of his stall. I now understand why he was so reluctant to get up and move for us. Essentially his feet were falling apart. I feel that he knew what was best and that we should have let him stay down. We had him standing on a piece of carpet that we had put down to help cushion the ground. As I was inspecting his feet, the coronary band on his left front foot started gaping and pus started oozing down the hoof wall. There was so much pouring out of the coronary bands that is was creating puddles around his feet. Right before my eyes, I saw the coronary bands begin to sink. The coronary bands became a valley that was deep enough to roll a marble around, and the hoof wall was taller than the coronary band. It was similar to watching a tire deflate. We soaked his abscesses and got him back into his stall. Within two days, his soles began to bulge. The sole was stretched so tight that eventually it cracked open and created a flap. When you lifted the flap, you could clearly see the coffin bone. Here is the only good sole view I have from this time frame. I had a very hard time making myself take pictures of a horse that I was not sure was going to live. The blue arrows are pointing to the edge of the coffin bone. A huge flap of his sole has been trimmed away; it was just catching dirt and debris. All four of his feet were this bad. Druid was up only minutes a day. We had him on straw to help with the bedsores that he was developing (straw is slicker and less abrasive). Straw ended up being a bad choice. Druid foundered because of his diet and metabolic issues. Little did we know that straw often has as much, if not more, sugar than hay, not much nutrition but lots of sugar. You will find more information on this at www.safergrass.org. Even though we were trying to correct his diet, he was eating the straw and undoing our efforts. Druid had already lost a fair amount of weight when I met him, but he was still in very "good" flesh. These pictures were taken when he first started to founder and before I met him. In these pictures, he is very fat. Some of the more blatant indicators that he was in trouble were the large, hard cresty neck, the fat pads across his shoulders and around his tail head. The area above the eyes is bulging instead of depressed. Another visual indicator of just how much excess weight he was carrying, was that his sheath was very large. There was a crease down his back and finding his ribs was not easy. Prior to his acute laminitis, Druid struggled with gravel and was often foot sore. This was a good indication that something was going on with his feet. He had good strong walls and thick soles, there was no visible reason for him to be this sore. Once again, Katy Watts has an excellent list of laminitis indicators on her website, www.safergrass.org. Please read her list to get an idea of how subtle the signs can be. Every thing that she lists, I agree with and see almost daily. These pictures were taken just 18 days apart. The coffin bone has been covered by new tissue. This new sole was very soft and felt like skin. I found it amazing how quickly his feet were repairing themselves. We did bandage his feet and used Animalintex poultice pads, but it was excruciatingly hot and the bandages seemed to create too much heat. 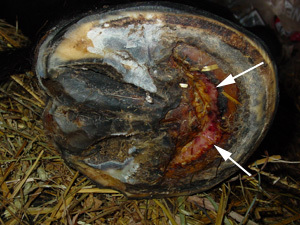 I have worked with enough foundered horses that have been painstakingly kept clean and found that they abscess as much as the horses that are left uncovered. We decided to follow our gut feelings and only bandage minimally. Let me explain who "we" are. "We" is made up of Catherine Mack, Peter and Haley Walsh and I. Peter and Haley are Druid's owners. They are both professional horse people with amazing amounts of knowledge, but neither had ever witnessed such dramatic laminitis. When Peter found Druid in trouble, it took over 45 minutes to walk Druid to the barn. The barn was only a short distance from the pasture, normally a one or two minute walk. Because Druid was so dramatic, Peter and Haley immediately called the vet. The vet prescribed stall rest, DMSO, Acepromazine, Banamine and copious amounts of Bute. Another part of the "we" is Catherine Mack. When she heard of Druid's dire situation, she invited Peter and Haley to move Druid to her barn. She had nursed her half Connemara, Polo, through severe laminitis and felt compelled to help them with Druid. Plus her barn was set up to more easily handle a horse this sick. Catherine was amazing; she nursed Druid through the worst of this ordeal. She carried him food and water and sat with him for hours. Catherine worked hard to get his diet optimized. One of the most important observations that she made was noticing that Druid was suffering from ulcers. Later, this would come into play again. There is another major component of Druid’s committee, Dr. Eleanor Kellon, DVM and the Equine Cushings Yahoo Group. This group and consulting with Dr. Kellon gave us the courage to continue on even though it seemed a lost cause. This forum has helped owners around the world save their laminitic horses and ponies. Over the last decade, it has grown and became an even better resource. If you are needing help or wanting to learn more about laminitis, insulin resistance, and Equine Cushings, go to the website listed below. The site has wonderful, current information. If you have specific questions, you can then access the message boards associated with the site. 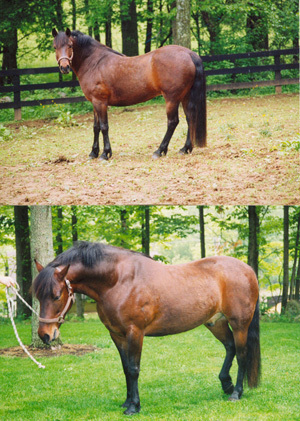 The most comprehensive, up-to-date information on Laminitis, Equine Cushings and Insulin Resistance. For a comprehensive overview of laminitis following similar protocols as the Equine Cushings group above, there is a new Equine Laminitis Ebook available. 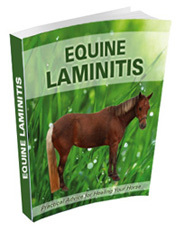 Written in clear, simple language that is easy to understand and implement for both beginners and experienced horse people alike, this ebook will not only teach you everything you need to know about laminitis but will also give you practical ways to prevent, treat and manage the laminitic equine using safe and effective, natural methods. In this particular picture, Druid is grimacing and grinding his teeth. When he was at his worst, this was how he looked all the time. I did not recognize the signs and did not realize the importance of dealing with ulcers. I did not pay particular attention to the grimacing. It was hot and miserable; I attributed this facial expression to the heat and pain. Catherine knew otherwise and insisted that we get him on ulcer medication. It was not just the grimacing that told her he had ulcers. It was the grimacing paired with his not eating. We were begging him to take a few bites of food at a time. This was a very nerve racking. Prior to the ulcer medication, Druid would only eat a bite or two of food. After a few doses of medicine, Gastrogaurd, he began readily eating. This was a huge relief, he had not been eating enough to sustain himself and now he was eating a more reasonable amount. 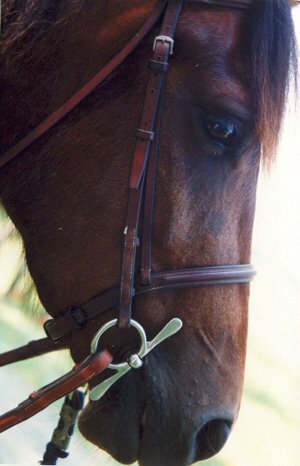 It is not uncommon to see this expression on a horse, so do not assume that all horses that make this face have ulcers. It was the combination of facial expression, teeth grinding and not eating. What confused me was that he was in so much pain, I thought that was causing him to not eat. If you look at the photo below, you can see the bed sore he is getting on his elbow. This picture also shows his normal stance when he was up. What you cannot see in these photos is the profuse sweating and shaking that would start when he got to his feet. His whole body would tremble from the pain. Letting him stay down was clearly the best option. When we tried to get him to move, it took a horrendous amount of prodding. I would never do that again. Even though he showed some improvement after getting up, I know it did more damage to his feet. Druid was not alone in his stall. His stall was like a three ring circus. The dogs figured out that this was the place to be, and Catherine's two Shetland ponies figured out that there was always fresh food and water available. All it took was a quick dash under the stall guard. Catherine also made it a priority to get his bedsores to heal. She religiously covered them with triple antibiotic ointment. When he left her place, they were well on the way to getting better. Druid only occasionally looked this good, but moments like this gave us hope and made it hard to put him down. Peter and Haley were also amazing to work with. They realized how sick Druid was, and just took things on a day-to-day basis. They both rolled up their sleeves and did whatever was necessary. The most amazing thing was the Druid was insured for a good amount of money. He was worth more dead than alive, yet they still could not bring themselves to call it quits. We were all prepared to put Druid down if it became obvious that this is what needed to be done. The problem was that we could never decide what day that should be. After a particularly bad night, an exhausted Catherine would think that was the day, yet Haley and I would think he looked much better. Other days, I felt like the grim reaper, but the others wouldn't agree. This continued for weeks. This guy is alive because he had a committee in charge of him. As we all know, committees can never make decisions. The eighth month is when Druid's hooves really started changing shape. Ten months later, we ride Druid! Return from Druid's story to the homepage.